The last part of my skincare week is dedicated to face masks, let's face it we all use them so they need a post of their own! Who doesn't love a good pampering evening every now and then… For me this usually consists of a bath (which I'm finally able to enjoy again now that the heat has calmed down) and a face mask of some sorts. If I don't feel like having a bath I'll leave the mask on while I enjoy watching a few a lot of YouTube videos from some of my favourite vloggers. Face masks is something I've only gotten into in the last few months and now I'm hooked. I have two on the go at the moment and I try to keep to a routine of using them weekly (with a few days apart in between each mask). Although I'm always intrigued to pick more up on regular shopping sprees, I do prefer to stick to 2/3 face masks at any given time, otherwise I feel like too many products will do more damage than good! 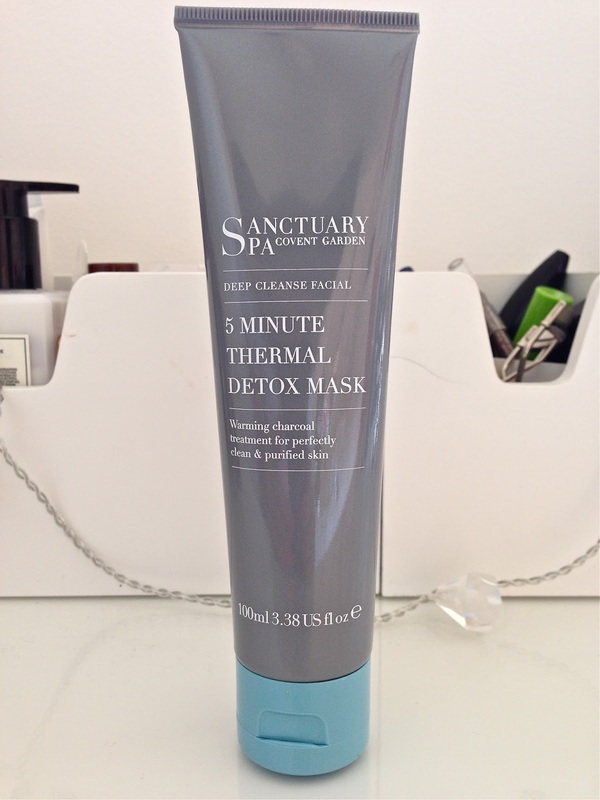 First up is the increasing popular Sanctuary 5 Minute Thermal Detox Mask, which I absolutely love, especially since it's not your typical clay mask. It's a thermal mask meaning it will heat up on the face as soon as you start applying it, which I find amazing (don't worry your face won't go on fire or anything)! Another thumbs up is that this doesn't dry out on the skin leaving you with a statue-like face, something I'm not extremely fond of (don't get me wrong I'd put up with it if the mask was worth it but with this it's not needed). One benefit for me with this self-heating mask is that I don't have to worry about steaming the face first to open up my pores, it does it all for you as well as extracting out all the impurities within *lazy part of me is loving this*. On top of that it's extremely affordable considering the quality and the fact that you get 100 ml of product, so it's definitely one to try out (which you can do by buying a sample size sachet). I will definitely look into trying out more products from this brand in the future, as it has definitely left a great impression on me! The second mask is totally different from anything I've tried before, I'm talking about the Nip + Fab Bee Sting Fix Lifting Mask. Now you're probably thinking why am I using a lifting mask already, but I can confirm that the lifting part of it is not what attracted me to it; instead it was the bee venom as the key ingredient that stood out to me the most. I know it's terrible that I never do patch tests when it comes to lotions and potions, but with this mask I felt compelled to carry one out, as I had never been bitten by a bee and I didn't want any nasty surprises. This mask claims to "control the facial muscles, increase blood circulation gently plumping out and firming the skin, making fine lines and wrinkles look smoother." Whilst I can't comment on how well it fades wrinkles since I don't really have any (I'd like to think I don't anyway), I can confirm that this gel like textured mask will plump up your skin beautifully whilst retaining moisture. You can use it in two different ways: as a quick morning mask or as a more intense overnight treatment. I have tried both and definitely prefer the overnight treatment as I'm just not a morning mask type, but if you've got something important happening and you need a little perk me up for the skin, then a quick mask will also do wonders. So these are the two masks I am currently using and enjoy using them both. Have you tried any of these masks yet? Or do you have any better suggestions for me? Love the sound of that Nip Fab mask!